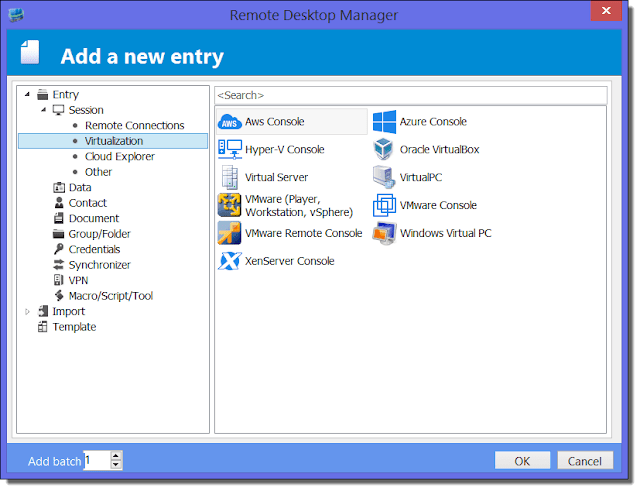 Remote Desktop Manager 10 is one of the most feature-rich and the most powerful remote management tools I know. Aside from helping you organize your Remote Desktop connections, it supports a plethora of protocols and even allows you to administer virtualization solutions and cloud environments. Notice that there are two versions of Remote Desktop Manager. The previous Standard edition has become the Free edition, whereas the version I tested for this review is the Enterprise edition. If you want to know which of the features discussed here are available in the Free edition, check out this comparison table. In this article, I use the abbreviation “RDM” to refer to the Enterprise edition. RDM has so many features that I can only scratch the surface with this article. Devolutions, the maker of Remote Desktop Manager, had essentially the same problem that Microsoft had with Office. Namely, how could they pack as many features as possible into one interface without overwhelming users? The answer is the new customizable user interface that counts like MS Office on Ribbons. What I like most about RDM is that it integrates many third-party applications like VPN solutions, password managers, and numerous remote management tools. RDM distinguishes between four different types of sessions: Remote Connections, Virtualization, Cloud Explorer, and Other. 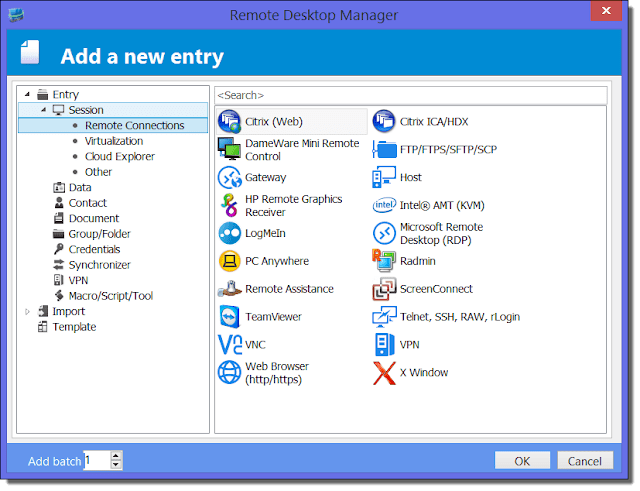 Remote Desktop is only one of many remote connections protocols that RDM supports. Here is the complete list: Apple Remote Desktop, Citrix (Web), Citrix ICA/HDX, DameWare Mini Remote Control, FTP/FTPS/SFTP/SCP, RD Gateway, HP Remote Graphics Receiver, Intel AMT (KVM), LogMeIn, Microsoft Remote Desktop, PC Anywhere, Radmin, Remote Assistance, ScreenConnect, TeamViewer, Telnet/SSH/RAW/rLogin, VNC, VPN, Web Browser (http/https), and X Window. HTTP is perhaps an unusual protocol for a Remote Desktop manager. The Web Browser allows you to specify a URL and your favorite web browser that RDM will launch when you open the corresponding session. Many applications can be managed remotely through a web interface, and RDM’s aim is to integrate any thinkable remote control solution into one tool. The point is that you can organize all your remote management solutions in folders and store detailed information about them in RDM’s database. Also, in many cases, RDM becomes the shell for your remote connections. Thus, when you open a Web Browser session, RDM can load the corresponding web interface in one of its tabs. In addition, you can manage all your credentials at a central place. I will say more about the powerful credential management features below. RDM supports the most prominent virtualization solutions: AWS Console, Azure Console, Hyper-V Console, Oracle VirtualBox, Virtual Server, Virtual PC, VMware (Player, Workstation, vSphere), VMware Console, VMware Remote Console, Windows Virtual PC, and XenServer Console. Not all the Virtualization sessions are about remote management. For instance, if you have VirtualBox installed on your PC, you can easily add a particular VirtualBox machine to your RDM Sessions database. You can then start the virtual machine from the RDM interface. However, in the RDM version I tested (10.0.15), the virtual machine will be launched in a separate VirtualBox window and not in one of RDM’s tabs. I also tested the AWS Console feature. It enables you to perform some basic management tasks for EC2 instances in Amazon’s cloud. For example, you can view the status of instances and start or stop instances. Of course, RDM can’t replace Amazon’s cloud console. However, AWS integration is quite useful for another purpose. You can directly connect to instances and create new RDM sessions from the list of severs in RDM’s AWS Console. If Linux runs in the instance, RDM will launch an SSH session. 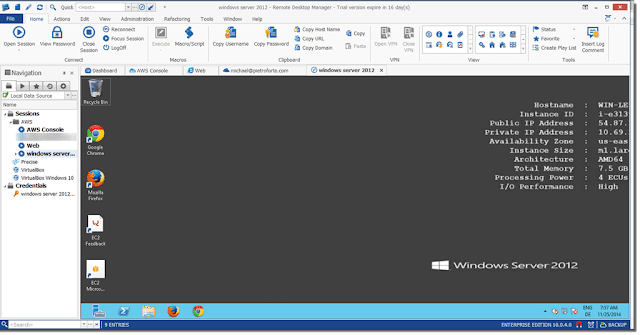 If you Quick Connect to a Windows server, a Remote Desktop session will be opened. 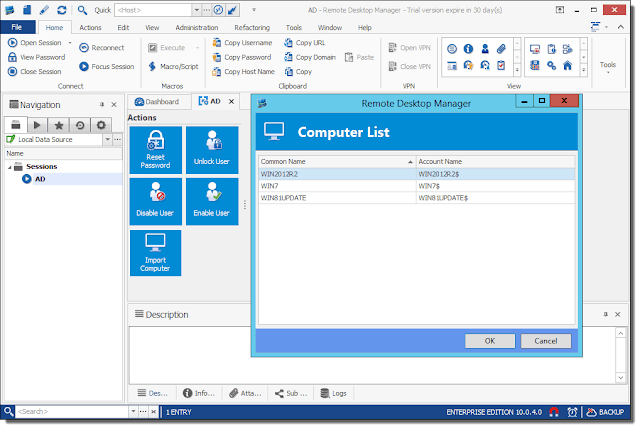 If you have remote servers in one of the above virtualization solutions, you can quickly add them as entries to RDM. The main advantage over Quick Connect is that you work with RDM’s credential management and can place the servers in your RDM folder structure for easy access. You can also use RDM to connect to various cloud drives. These are the supported cloud providers: Amazon S3 Explorer, Azure Storage Explorer, Azure Table Storage Explorer, Dropbox Explorer, and OneDrive Explorer. In my test, I connected to Microsoft OneDrive. 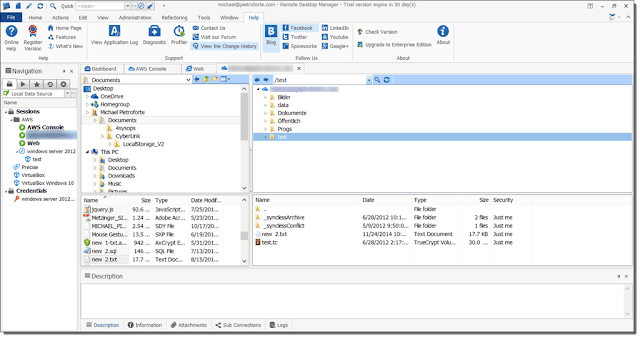 RDM opened a Windows Explorer–like interface that consists of four panes. The panes on the left show the folder structure of the local PC and the files of the selected folder. In the upper right pane, RDM displays the folder structure of the cloud drive, and below you get a list of the corresponding files. You can easily copy files between local and cloud drive with drag and drop. Of course, for some of the cloud storages, you can also do this in Windows Explorer. However, as mentioned above, the main point about RDM is to have all your remote connections in one coherent interface. This means that you access the files in your S3 storage in the same way as your files in Dropbox or on a Linux server via SCP. To categorize remote connection types is not easy, and some connections don’t fit in any category. The Other Sessions category includes the following: Active Directory Console, Command Line, Data Report, Database, Inventory Report, Play List, PowerShell, SNMP Report, Spiceworks, Terminal Server Console, and Windows Explorer. 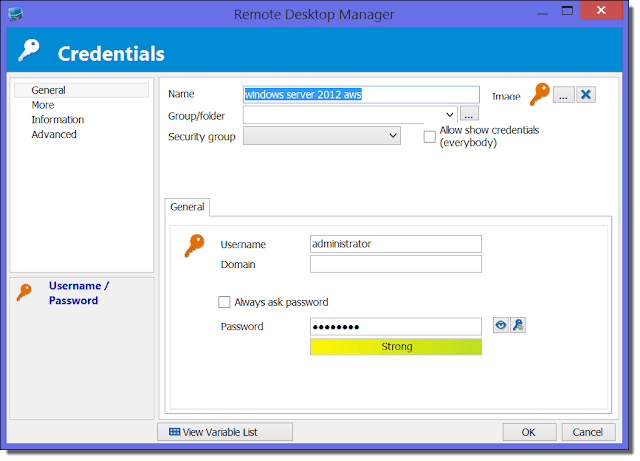 The Active Directory Console is new to Remote Desktop Manager 10. You can perform some basic Active Directory management tasks such as resetting user passwords, but the main point about this session type is that it allows you to import computers from Active Directory to the RDM interface. With a few clicks, you have all computers from a certain group or container imported in RDM. This can save you a lot of configuration time if you have many computers to manage. If you have only one account to manage your servers, you are lucky. I just counted. I have more than 100 different passwords in KeePass. And I store only the ones I use frequently there. RDM’s password management capabilities are amazing. It has its own credential manager, but it also supports any password manager I know. Even Outlook can be used. You can leverage these third-party tools in two ways: You can either import the accounts into the RDM database, or you can integrate the third-party password manager in RDM. In my test, I integrated a KeePass database. RDM automatically finds the database, but you can configure any KDBX file. 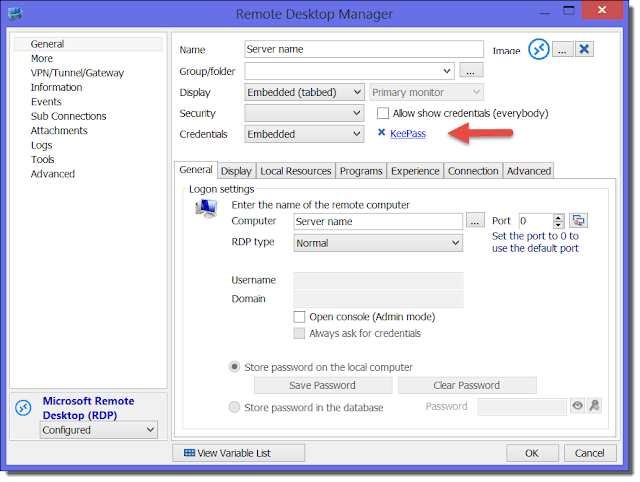 In the RDM entry for which you want to use KeePass, you select the account from the KeePass database that you want to use for this remote connection. When you later connect to this server, and if you already opened KeePass, RDM will read the credentials right from the KeePass database. If you have yet to open KeePass, RDM will launch the password manager, and you have to enter your master password in the KeePass UI. For every RDM entry, you can work with a different authentication method. An RDM entry can also inherit its credentials from other RDM entries. You can work with the Windows credentials of the local machine, and you can use your personal or the RDM credential repository. The cool thing about a central repository is that you can configure it in a way that doesn’t reveal the passwords to admins. Therefore, with RDM, admins can manage servers without knowing the administrator password. This brings me to my next topic: RDM is a real team player. As with most of RDM’s features, you have a variety of choices where you store the RDM database. You can work with your own local database, but you can also share the database with other admins. 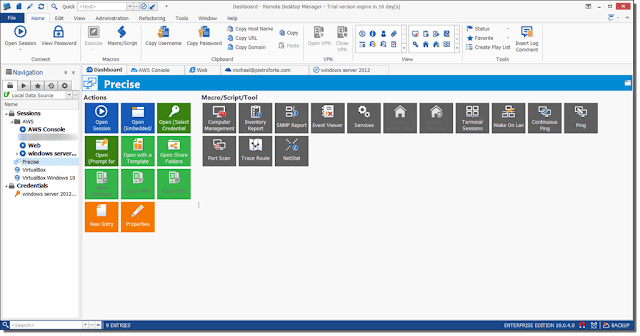 These are the supported data sources: Remote Desktop Manager Online, SQLite, XML, Amazon S3, Dropbox, FTP, MariaDB, Microsoft Access, Microsoft SQL Server/SQL Azure, MySQL, Remote Desktop Manager Server, SFTP, and Web. 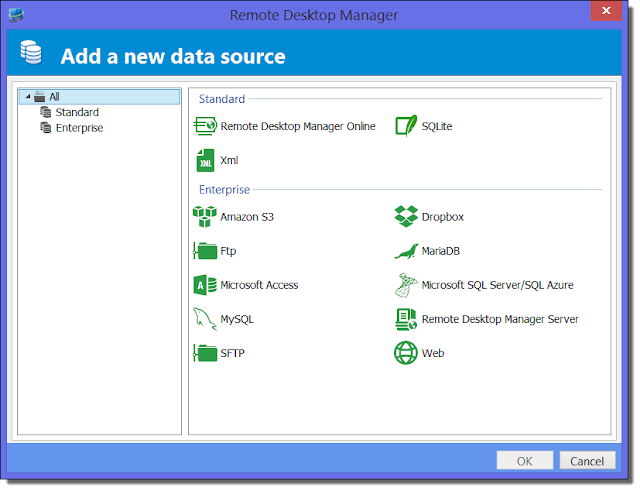 Remote Desktop Manager Online is Devolution’s cloud storage for your RDM database, and Remote Desktop Manager Server is a data source that you can install on your own servers. RDM allows you to work with multiple databases, but not simultaneously. You can configure RDM to prompt you at start-up for the data source.